The Fraxel Re:store Dual laser is a 3rd generation Fraxel laser that is able to precisely target microscopic areas of the skin, using focused laser columns to eliminate old, damaged skin cells, penetrating beyond the skin’s surface. Fraxel treatment stimulates the body’s own natural healing process which replaces damaged skin with fresh, glowing, healthy skin. What does the Fraxel treat? 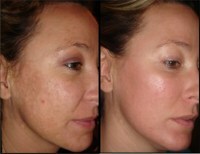 The Fraxel can treat age and sun spots, acne scars, melasma, surgery scars, wrinkles, and sun damaged skin. By design, each Fraxel treatment targets between 20-35 % of the skin’s surface, leaving the remaining 65-80 % available to heal the treated areas quickly and thoroughly. 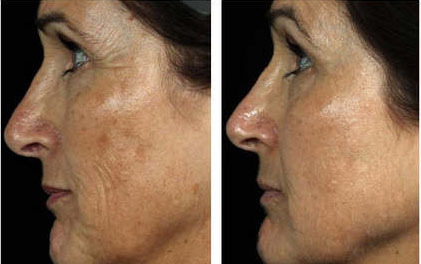 With this treatment, a tailored plan can be made to your skin’s individual needs. 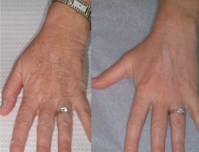 The results are progressive, with maximum results evident in approximately 2 to 6 months after the last treatment. There are typically minimal risks to this laser procedure. Most people will have redness for up to one week, swelling for 48-72 hours, and dry or mild peeling to the skin for a week. If the thulium laser component is used (for extra effect on brown spots and superficial skin texture abnormalities), there may be more significant peeling for 5-7 days. In darker skin types, there is an increase chance of the skin becoming temporarily darker. Permanent hypopigmentation (whitish skin color) and frank scarring would a very rare risk as only a relatively small part of the skin surface is affected by each treatment session. Everyone’s skin is different, but clinical studies suggest that for most people, maximum results are obtained in 3-6 treatments. 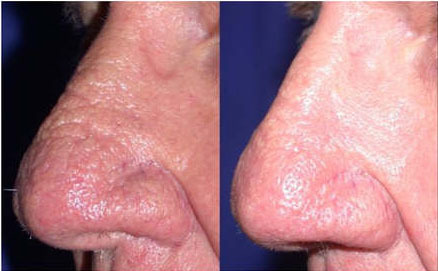 There is no pretreatment in advance of the laser treatment unless you are advised otherwise. Your skin should be cleaned to remove any makeup before the procedure. A topical anesthetic cream is applied in the office 60 minutes prior to treatment. 1. Arrive 1 hour before treatment for topical anesthetic application. 2. Take all prescribed medications, like Valtrex, the morning of the procedure. 1. Apply ice packs as needed. There will be a sunburn sensation for about an hour after the treatment. 2. Use sunblock at all times. 3. Use gentle moisturizers and cleansers and avoid retinoids and glycolic acids for one week. You should moisturize as much as needed. 4. Sleep with head elevated for the first two nights to decrease swelling. For emergencies at night or during the weekend, call (205) 290.0021, leave a message and the doctor will contact you shortly thereafter.